The Dutch defender has broken his nose four times so far this season. 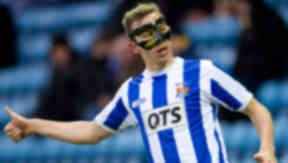 Kilmarnock defender Jeroen Tesselaar fears he may have to wear a protective mask for the rest of his career. The 25-year-old has worn the face shield in recent matches after breaking his nose on four occasions this season. The Dutchman says he will have to wear the mask until the end of the current campaign but admits it may become a permanent part of his kit. He said: "I broke my nose at the beginning of the season two weekends in a row, and now I broke it again. So I need to wear some protection. "I don't know for how long yet. Until the summer for sure but maybe forever or for another year. "You get used to it because I train every day with the mask as well." Tesselaar, who is out of contract at the end of the season, believes Allan Johnston's men are starting to show what they are capable of after a slow start to the campaign. The Ayrshire side face Hibernian on Saturday before playing Tesselaar's former side St Mirren next weekend. "We had a bad start to the season, we had a lot of new players and we had to get used to each other," he said. "But everyone has got to know each other and the manager and we need a good spell now. "I think we need two wins in a row now. If we win two games, we can look up."